Discussion in 'Proposal Ideas' started by MarlonN, Nov 21, 2016. I don't know if ladies truly appreciate the amount of pressure that a guy goes under in order to pull off the best proposal he can, and how they worry about being able to create a unique memory for their chosen one - but I'm hoping that in the future we'll see more ladies proposing instead. What do you feel about that? sachiemay and valeria101 like this. It depends on the individual lady, of course! Some ladies love a romantic swoon-fest and MORE POWER TO THEM, and bless the partners who give them a big production. And let's be honest, some men do actually enjoy creating the big production! Then there are some ladies (like me! ) who have zero interest in a grand proposal. I found out, after the fact, that my husband had initially planned a very grand proposal, that involved a series of clues that would start with a card left on my car after work and lead me home, then eventually to the spot of our first kiss, where he would be at the end of a candlelit path on bended knee. He actually got so worked up and nervous about it the night before he was going to propose that he couldn't sleep and ended up getting a terrible migraine the next day and didn't follow through. After talking to me more and really listening to me he realized that MY perfect proposal was to simply be honestly and sincerely asked during a quiet moment between the two of us. He was putting pressure on himself to create floof and drama that really wasn't my thing. So a day or two later he just came up behind me in his kitchen and popped down on one knee. I still have a box with all his clues and the candles and stuff. It's sweet, but I am so thankful he changed plans! Matthews1127 and alupha like this. Reading through your post, I couldn't help recalling the one episode on Desperate Housewives (Don't say it, I know...) where Lynette's husband Tom tried to do that whole 'romantic' leaving clues and all that, and something went wrong and Lynette ended up stranded alone on a lonely road at night. I have to agree that sometimes simpler is better. I like to watch elaborate proposals on TV/youtube or whatever but wouldn't particularly want one myself, especially if it involved being the centre of attention in public. Not my style at all. You know your lady though so trust your gut. Regarding women proposing, I know a guy who was proposed to and secretly felt a bit cheated out of his moment - he never told his wife though. I know he intends to "propose" a renewal of their vows after 5 years of marriage. My personal opinion is that by the time of the proposal, your SO should know you well enough to know if you put thought and effort into it or not. I've heard some horror stories of guys just proposing on the couch at home or even tossing the ring box at their SO after a fight as a guilt trip. I think its all about expressing your thoughtfulness and I agree with the other poster that I don't think most women want to be part of a flash mob or made to feel like a spectacle. It should be a special moment (obviously) between you two and bigger isn't ALWAYS better. 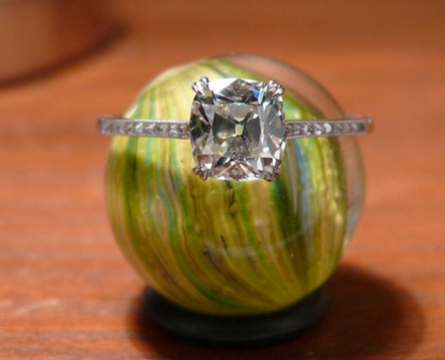 I don't like the idea of women proposing but I do still have some old school mentalities. I think it is a gesture in chivalry and a tradition I wouldn't want to see change. I'm like @elizabethess, I'm sorry, I just don't get why the proposal has to be a huge drama and event. Why not just say "I love you and I want to marry you"? Surely it's the sentiment that matters and not some elaborate scheme to stage it? Maybe I'm just not romantic, but it didn't matter to me that we were sitting in the car talking, after a night out, when my husband told me he wanted to marry me. It didn't mean he loved me any less than if he'd concocted some elaborate scenario, the result was the same. We've been married 38 years now. Matthews1127, OoohShiny, bludiva and 5 others like this. the amount of pressure that a guy goes under ... What do you feel about that? This is an interesting perspective, because it implies that us women want something grand and unique. I think that if you were to take a poll you'd find that most of us want something sentimental more than grand. My boyfriend and I had this discussion a few months ago when we started talking about designing my engagement ring. He was acting a little "off" and when I asked what was up he said he was just feeling nervous about planning the perfect proposal. So he put the pressure on himself; I didn't. I'm so glad we had that talk, because I was able to reassure him that grand, elaborate proposals weren't my thing and I was sure that if he just thought about us and what was special between us it would be wonderful. I told him it could be as simple as overlooking a beautiful spot that we rested at during a bike ride, or the top of a mountain we hiked, or simply holding each other while watching a sunset together. It doesn't take being serenaded by concert violinists while doves are released in the background... just pure, honest exchange of love and emotions. That'll get a girl every time. I'm the kind of woman that appreciates the plan of grand romantic gestures and the execution of all of the details to honor his lady by expressing his love through creativity tailored to adoring her. Those make the best stories, imo. That's a horror story? In my opinion, far from it. My (now) husband did just that. We'd woken up late, cooked a late breakfast together, and spent a cold New England Sunday together cuddling and watching movies. Into the evening, he remarked what an awesome day we'd spent, how easy it was to be together, and how he wanted to spend the rest of his days that way. I can tell you there was nothing horrific about it; I was touched that he was moved in the moment and decided to just say how he felt. I was not surprised he proposed, but very surprised he proposed then. We spent the next few weeks picking out the perfect ring together, and I wouldn't change a thing. Grand gestures sound like winners, but I'd honestly rather have heartfelt sincerity that lasts a lifetime than worrying about a story for the sake of impressing others. Our story impresses me, and that's just fine by me. Note: Chainsaw Not Sold Separately. TheGarnetGirl, Matthews1127, OoohShiny and 7 others like this. I'm with you, Aljdewey. Sounds like a perfect proposal to me. Bonus you got to pick out a ring together! Interesting to hear a guy's perspective. First, who is pressuring you? If it's your intended, maybe that's a warning sign of other things in the future relationship that need to be addressed. If it's you, maybe give some thought to why you feel this way and why you feel that putting so much pressure on yourself is necessary. If you're influenced by social medial and TV, let that go. Real life isn't either of those things. Most women when asked will say that they hate the staged proposal and prefer something intimate and heartfelt (and expected). Second, don't most people mutually agree to get married before the proposal anymore? I would imagine that most reasonably mature couples would have talked about marriage long before the proposal stage and have decided whether or not to get married (to each other). I would hope that most have also talked about literally *everything* that would need to be talked about in order to be ready to get married. To my mind this includes the nitty gritty of things like the ring budget, whether or not to go into the marriage with it as debt, whether that money would be better served towards other marital items like a down payment on a house, how you plan to pay for the wedding, what kind of wedding you want to have, whether or not you want kids, what your views are on parenting and how to handle differences, how to handle in-laws and extended family - especially around how much you share about your relationship with them, how you handle conflict with them, and how you will structure major holidays, what you want out of life, how you plan to achieve that. If this is the case, I would imagine that the proposal itself is just a question of formality, and I'm not sure where the pressure is coming from. Maybe circle back to point 1. But this could also be a cultural thing, as these things are done differently in different parts of the world. ETA: I have to admit that I see the big production proposals as a throwback to the 1950s where the men had all the power and the women did nothing but wait with baited breath...it just doesn't make sense to me. I've been married almost 20 years now, and we decided together, went ring shopping together (did the budget together too since we were living together at the time), had a nice dinner, went for a walk in our favourite park when the ring came in, and got engaged. I wouldn't change anything. I'm sure there are women who love big grand proposals but I liked mine just the way it was. I had a timeline of the months when it would happen and I knew my ring was coming at a certain time but he and the jeweller still managed to surprise me with it coming early. After we picked it up we went to the park where we had our first date and he got down on one knee and proposed near a garden area. It was very simple but I loved it! I didn't feel like I needed it to be some grand surprise at all. In fact there was one night before the proposal we went to dinner and there was a Mexican band performing that night and they came around the tables singing to people and I looked horrified at my boyfriend at the time and was like.. Did you bring us here on purpose?? They better not be coming over here so you can propose!!! He just laughed and told me no, that it was a coincidence but that the look on my face was halarious because I seriously thought he did it on purpose. But definitely not everybody wants some public proposal spectacle. If he had done something like that I would've been very upset. I don't even like telling the wait staff it's my birthday for free cake lol! I don't think I would like my girl proposing to me. Maybe I'm old fashioned, but I'm okay with some gender specific roles. I like to open doors for my girl, carry the heavy stuff, be the leader of the house, protect her, take care of the lawn, etc. It's not because my girl can't do that but because it's a sign of respect I want to show her. A good proposal doesn't have to be a big production, but it should be thought out enough to create a memorable and meaningful moment -- and maybe even one you don't mind repeating, since most people will ask how it happened. I think that will vary widely based on the two personalities of the couple as we've already seen here. Really knowing each other and what is special to you two and staying true to all that is the best proposal. in my case we didn't have a proposal since we eloped and i know other couples that had more of a discussion than a proposal, i don't feel i missed out and quite like the idea of deciding together. Matthews1127 and sledge like this. I always said if I proposed to someone I would pull the ring box out- tell them i want to marry them but if they don’t catch it then I rescind the offer and toss it high in the air. Valeria, that might be true for most but certainly not for all. When my now DH proposed he was not completely confident I would say yes as I had made it clear from the beginning (and we dated 4 years) that I did not want to ever get married. I didn’t think I would like being married and I loathe change and marriage was a scary big change but he hung in there. He mentioned marriage year 2 of our dating and I felt sick to my stomach at the mention of marriage and excused myself went to the bathroom (we were at the River Cafe for Valentine’s Day) and didn’t return for 20 minutes. He didn’t bring it up again till almost 2 years later. So when he proposed (romantic and private no audience on a snowy afternnoon in the park) he truly didn’t know for sure. And I almost passed out as I didn’t see it coming. And I was not giddy with excitement either. I was nauseous. I really hate change. Lol. It all worked out for the best however and now being together almost 20years I can say with 100% clarity in hindsight it was the best thing I ever did. Hands down. Marrying my dh. The love of my life. Cannot believe I was unsure and waited so long. Anyway that’s all to say people vary. And there’s no one size fits all. And I think often the simplest most heartfelt proposals without frills and hoopla can be the most romantic. I would have hated a big production and would have been mortified. Making it meaningful has little to do with external factors and everything to do with what you say and how you say it. I still get chills remembering how freaking sweet my DH’s proposal was. MeowMeow and Matthews1127 like this. I've heard some horror stories of guys just proposing on the couch at home or even tossing the ring box at their SO after a fight as a guilt trip. She was going on and on about it because I hadn't asked her, but I wanted to do it unprompted and unexpectedly, not because she'd been moaning on about it (again). What would a person want from a proposal? To feel like they'd pushed their now-fiancé(e) into it during a moaning session and they might not actually want to do it? Or for them to do it unexpectedly and clearly off their own back because they really want to get married? sledge and Matthews1127 like this. I don’t think it’s the amplification of the proposal that matters, but rather the thought, and effort one puts into it to express their affection, and to make it memorable. Every story is unique to the couple; even short & sweet. I know I’ll never forget my DH’s proposal, and I enjoy telling the story to others, every time. There was no grand spectacle, but it was beautiful, sentimental, and extremely unexpected. He was so emotionally involved, and that made it 1000 times better for me! sledge, MeowMeow, OoohShiny and 1 other person like this. Anyone that has spent any significant amount of time with a women, has been to this point rather it was an engagement or deciding where to go to dinner. I can operate under extreme conditions and make mega difficult decisions easier than picking dinner, or my latest gripe....finding a damn setting for a diamond. Enough to make you just want to sometimes.